The famous Joynagar moa, a confectionery prepared from date palm jaggery (nalen gur) and puffed, rice could be given a geographical indication (GI) patent. If awarded, the patent would be the second for a produce of Bengal, after Darjeeling tea. Also in the pipeline for a GI patent are Bardhamaner Sithabhog, Shaktigarer lyangcha and Mursidabad silk. The patent means that the particular product can be made only in that area and cannot be copied in the countries where it is registered as a GI product. Darjeeling Tea, which got a GI patent in 2008, has been registered as a GI product in countries like the UK, USA, Germany and Russia. The Federation of the Association of Cottage and Small Scale Industries (Facsi) has started an awareness and sensitization program among confectioners who make Joynagarer Moa. They are being told about the details of intellectual property rights at an even held in the Joynagar-Majilpur Municipality area. Ashok Kumar Ghosh, Sri Krishna Mistanna Bhandar is the oldest moa shop in Joynagar, felt GI would be a big boost for the poor sweet shop owners keeping alive Bengal’s legacy. “Our shop was established in 1929 by my father. Earlier, babus from Kolkata would order huge quantities of moa during Poush Sankranti. Our moa has even been sent to USA. But fake products are being made all over the state, putting our identity at stake,” he said. Ghosh attended the awareness program conducted by FACSI and the patent office. 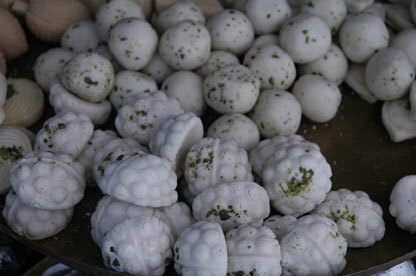 “There are over 150 sweet shops in Joynagar, Bahura and Charan, which make the delicacy. We shall sit and discuss the issue of the GI patent,” he added. Ghosh pointed out that Joynagarer moa is made of a special brand of aromatic rice called Kanakchur and nalen gur, which cannot be made elsewhere. FACSI president Sukhendu Bikash Ghose said the organization is trying to act as a facilitator for a GI patent for Joynagarer moa. “The confectioners have set up an association. A GI patent is only given to associations. We have got a mandate from the department of MSMe of the Union government to facilitate a GI patent for ethnic products,” he said. This entry was posted in Generic and tagged Bengali, darjeeling, GI, patent, sweet by sudipta. Bookmark the permalink.